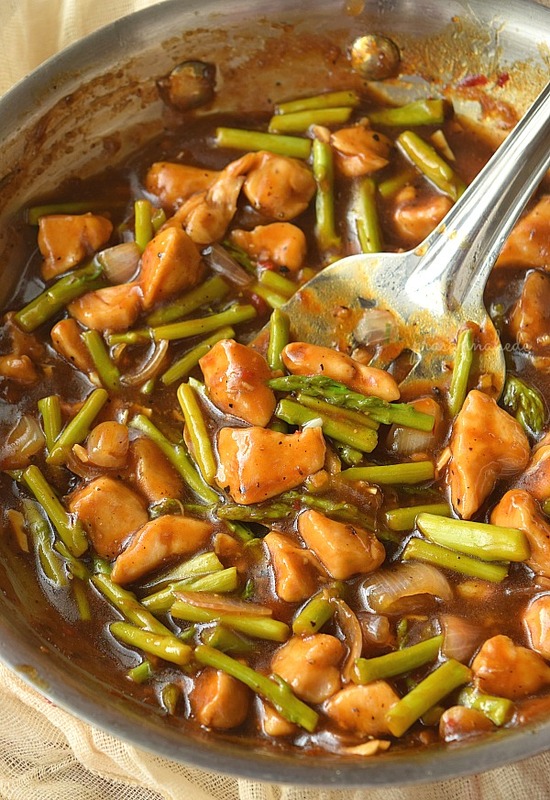 This recipe of Pepper Chicken Stir-Fry with Asparagus is better than any takeout and so easy that dinner or lunch can be fixed under 30 mins! Better than any takeout - this Pepper Chicken Asparagus Stir-Fry is so easy to put together,will take your 30mins and ready to enjoy this will any kind of rice/fried rice or noodles! I love tho fix lunch or dinner with ease and that too delicious such that the plate will be wiped clean. Even works best for lunch boxes and as slight heating in microwave will give you fresh and hot lunch to fill your tummy. What variations I can do in this recipe? There are lot of variations you can do to this recipe:One of my favorite variations is adding Broccoli to the chicken instead of Asparagus. Even instead of Pepper I have tried adding lots of Garlic to enhance the flavor or even adding Ginger will work great. 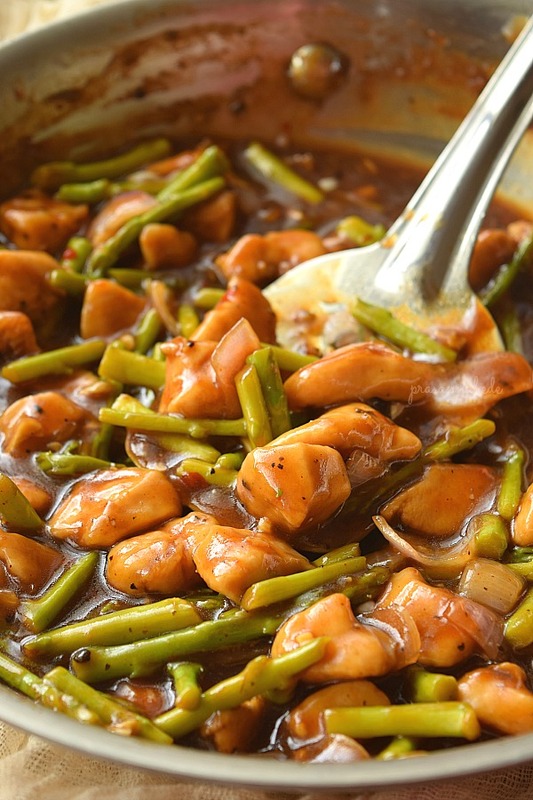 I have also tried adding few chunks of Pineapple to make some interesting Pineapple Chicken along with asparagus but added Pineapple at the very end instead of cooking it.It was amazing! I have realized that freshly cracked Black Pepper imparts so much flavor in any dish than bottled ground pepper. I would highly recommend to freshly crack black pepper instead of using ground black pepper. 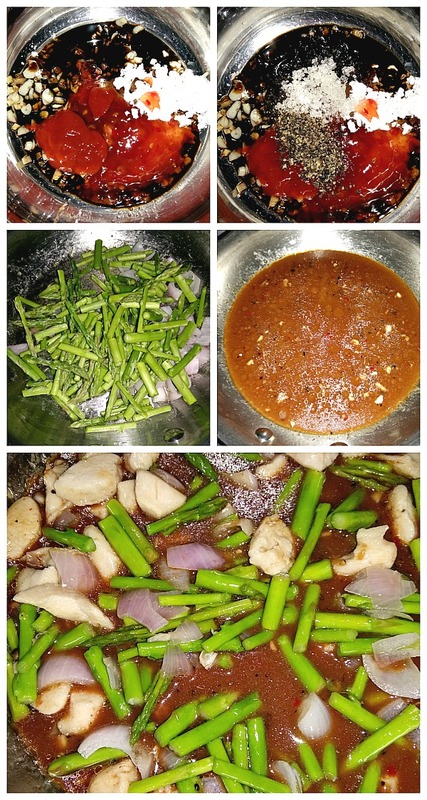 Here are the step by step pictures of How to make Pepper Chicken Asparagus Stir-Fry! 1. First we need to wash and cut the chicken breast into bite sized pieces. 2. Marinate with the ingredients mentioned under "Marination". 3. In a pan,add oil and saute it till cooked well.Make sure chicken does not get stuck to the pan. 4. In a mixing bowl,add the sauces and spices mentioned and mix well. 5. Add water to the bowl and mix further. 6. In the pan,add oil and saute, onion and asparagus till done. Keep it aside. 7. In the pan,add the sauce mix and cook it on low flame till thickened. 8. Add the chicken and asparagus with onion. 9. Stir once or so and serve hot. Delicious Pepper Chicken with Asparagus Stir-Fry is so much better than any takeout and easily fixed under 30 mins. Firstly,wash and pat dry the chicken breast. 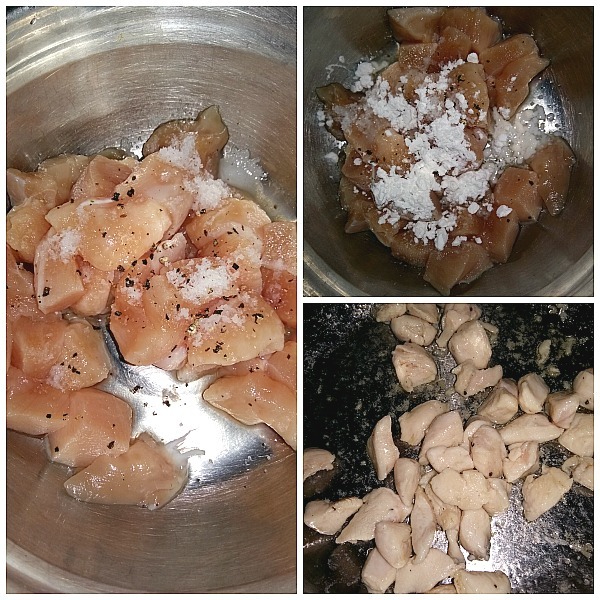 Marinate chicken with all the ingredients mentioned under "Marination". In skillet or pan,add 2 tablespoon Sesame oil, when its hot,add the chicken pieces and saute on medium to low flame till the chicken is cooked well. Make sure the chicken does not get stuck to the pan. In the mixing bowl,add 1 tablespoon sesame oil,sugar/brown sugar,chili sauce,sweet chili sauce,lemon juice,minced garlic,minced ginger,soy sauce,cornstarch,water and 1 tablespoon cracked black pepper. Next add 1 tablespoon Sesame oil and when its hot,add onion and asparagus. Fry for a couple of seconds. In that pan,add the sauce mix and stir for a few seconds for a low flame. Add chicken pieces,veggies and add the 1/2 tablespoon pepper. Mix well and cook on low flame till the sauce slightly thickens. Serve Hot with rice/noodles of your choice. 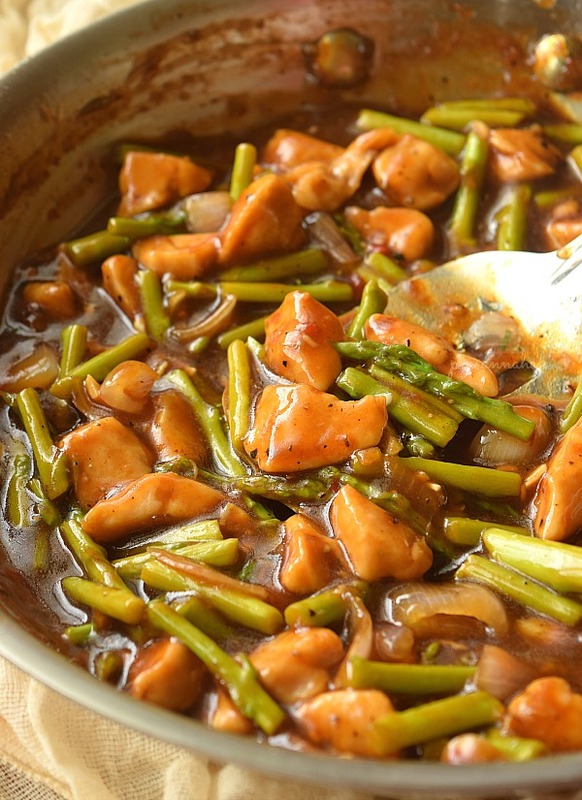 Love asparagus, and this stir fry looks like a great dinner for any night of the week. Quick to prepare, and leftovers would be great to take to lunch too. 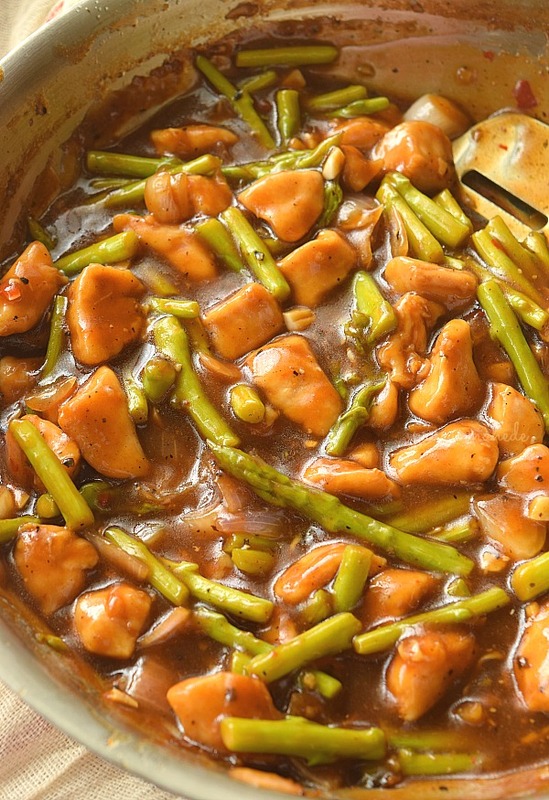 This pepper chicken stir fry looks absolutely dreamy! And I love the variations you included, like substituting broccoli for the asparagus. I totally agree that freshly cracked pepper is so much better. I was at my mom’s recently and she didn’t have it so I used regular pepper and was amazed by the difference. This sounds amazing, I love all those ingredients, and you are so right that freshly-cracked (or I like just freshly-ground) pepper makes a tremendous difference. So much more flavor, and no extra work! My husband is a big fan of stir fry. He says it is a great way to preserve the natural flavors and textures of vegetables, plus like you said so easy and quick.He is also an advocate of freshly ground pepper. So fragrant! Mmmm, that sounds delicious. And I grew up with a peppermill on the table - I don't even bother with the preground sawdust! This quick and easy dish looks perfect for busy weeknights. This dish looks so tasty! Wow this looks delicious and so saucy! Just the weeknight meal I was looking for! We're great fans of stir fry meals in our house and this recipe sounds delicious. I like the fact that other vegetables can be substituted when asparagus isn't in season.